5. You can create a folder (by clicking on "Create Folder") to arrange your documents as you would like. 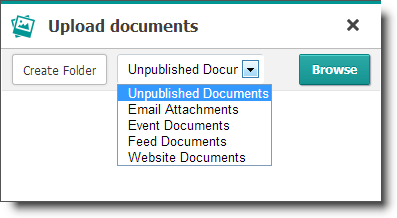 You can also categorize documents (Unpublished Documents, Email Attachments, Email Documents, Website Documents). To upload a document, click on the "Browse" button. 6. Select your document on your computer (you can select several documents at once). Then click on "Done" to finish. To share your documents, go back to the "Folders" page and click on the "Manage" icon of the folder tag and then on "Access". For more information, please read the How to use "Access Rights" pop-up article.